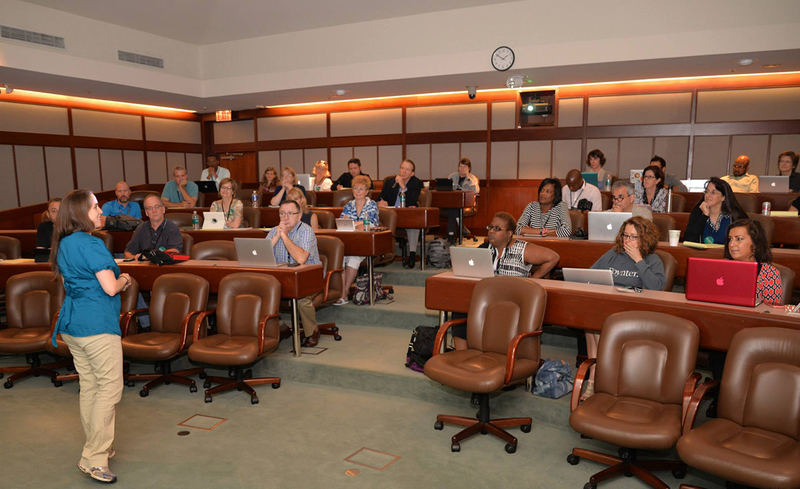 Participants at the Poynter Institute's Teachapalooza Educators Seminar learn from trainer Bethany Swain. Photo courtesy of Al Tompkins, Poynter. A few years back, I responded to a call from journalism funders that media programs move forward and innovate with my own call. If you want teachers to move toward the cutting edge of news, I argued, fund training to help them get there. While I’ve seen progress in the intervening years, training is more important than ever but funding for it remains elusive. I was always intrigued by the “teaching hospital” metaphor — the notion that journalism schools, like academic medical centers, should engage in research to advance the field while training students and practitioners. But I thought something was missing from the comparison: the critical element of continuing medical education. CME is central to the medical model in the U.S. Continuing ed also is important in other professions, such as law and engineering. Professionals benefit from training in the latest strategies and approaches, but educators learn, as well. Journalism schools would benefit from a similar emphasis on getting faculty and instructors training in current storytelling techniques and the tools to deliver messages to audiences. This EdShift series explores the impact of training on today’s J-Schools and how access to the latest ideas moves us all forward.